The very kind Pam Glew accepted to answer a few questions about her show – Beatiful & Damned, which opens tonight at Blackall Studios. 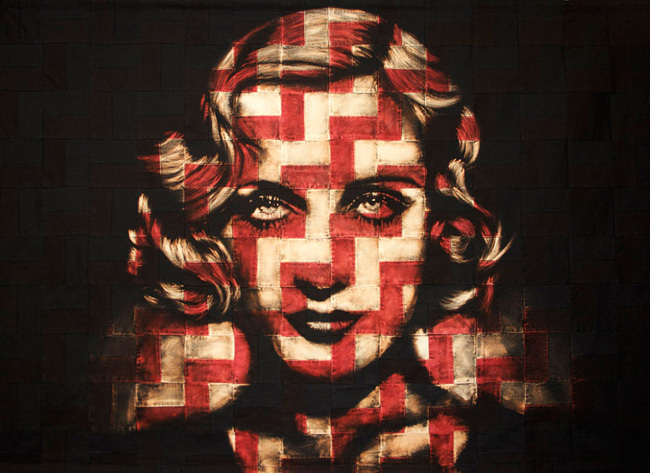 ART-PIE: Your show is inspired from the tragedy from the 20’s coming from society icons; their highs and lows, a period was also called Jazz Age. Do you like Jazz and did it play a role in your new compositions? Pam Glew: I wasn’t a massive jazz fan before making the work for the show, I think jazz divides people, love it or hate it, a bit like marmite. I have warmed to it, after digging around for research on the 1920s stars of the time like Kid Ory and King Oliver’s Band, I now kinda love jazz musicians, the old guys with a look of wear and tear. I think its the trumpet players cheeks that do it for me. I based most of the show on socialites, flappers, movie stars and pioneers at the time. The aviators Amelia Earhart and Charles Lindbergh (Lucky Lindy) are my new heroes. A-P: You are using authentic materials for this show, the same you could find at its time. Has it been difficult for some to get hold of? P-G: Pretty hard, i think i have also exhausted the supply of 48 star American flag, you used to be able to get hold of them pretty easily, but now they are rare. And the 1920 quilts and crewel-work pieces were sought after, i had to hunt them down. A-P: And what is the one you like most? 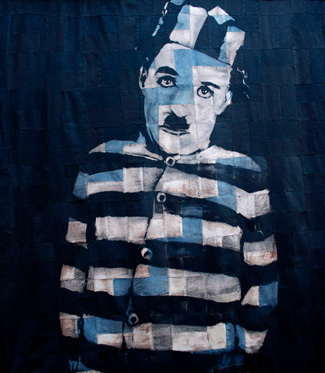 P-G: I like the 1920s quilts that i used for After Hours and Charlie Chaplin, it really evokes that time and looks precious. They are curiously thin, and when i used the burn out technique they just look so delicate, but still are quite strong and resilient. i think the 2 blue quilts are my favourite works in the show. But there is 15 new works on fabric, so my favourites change by the day. A-P: Could you tell us how the technique you used for the body of your new work differs from how you normally execute work? P-G: It’s the same bleaching technique as i use for the flags, its literally either bleach applied free-hand with a sponge, or paint brush, and then its washed out, dried, ironed, and re-bleached about 5-10 times until its light enough and the face appears. I also use a ‘burn out’ technique which paints on clear and only shows when you use steam, so that process is like magic. I made some of the fabrics like in Profane Angel and The Band, they are made by patchwork quilt-making, it takes so long but worth it! 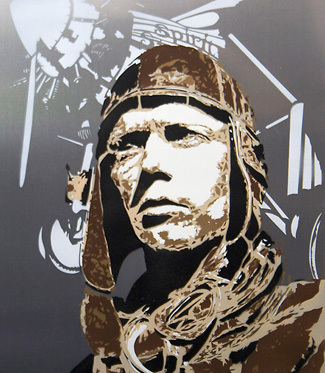 I also made some work on aluminium, using spray paint, they will be downstairs in the gallery in the ‘prohibition bar’ which houses a retrospective print show of limited editions and rare burn out prints on vintage fabric. A-P: How long for have you been working on this show? P-G: I started researching it last summer, watching silent movies, reading biographies of the silent movie stars, and gathering the antique fabrics. I begun making the work after my last solo, which opened November last year, so a good 6 months. A-P: You often exhibit at charity shows, have you got any more coming up before you next solo show in New York? P-G: Yes I will be showing in Dallas for the MTV’s Staying Alive Foundation exhibition at Goss-Michael Foundation Gallery, which is a nonprofit forum for British Contemporary art, all proceeds will going to help the Staying Alive Foundation continue its fantastic and vital work enabling young communities to combat HIV/AIDS at grass roots levels around the world. It is such a good cause, so I’m really excited to be involved, that is around September this year. And then the solo in NYC will follow that, so I’m starting work on the NYC show as soon as Beautiful and Damned goes up tonight.